When writing an article, the author usually has a target audience in mind and members of that audience are human, and therein lies the problem. Along the lines of a reverse “Turing Test”, we need to optimize our content not only for readability by humans but also by search engines as we never know if the reader is going to be human or machine. Furthermore, the language of search when people are using a search engine is somewhat different than that which we use colloquially. The ultimate test of the correct keywords to focus on is those which are the most popular search terms entered by billions of people every day. 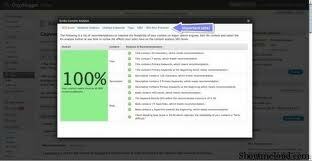 This is where the ScribeSEO Search Engine Optimization Plugin, comes in to help. ScribeSEO helps you find the keywords that are used when people are looking for the kind of content you are providing. Then, it analyzes the writing style of your post and makes suggestions on how to make minor changes so that the Search Engines enjoy reading it too. Finally, ScribeSEO provides link building tools so that you can build back links from other sites as well as cross-link content within your own site and identify other sites that might want to promote your content as well. First, it looks at the Title of your site: number of characters, number of words, primary keywords and do those keywords appear at the beginning of the title? Second, it looks at the Site Description: again number of characters, primary keywords and do those keywords appear at the beginning of the title? Finally, the Body, for number of words, keyword density, number of hyper-links, are these hyper-links towards the beginning, and the Flesch Reading Ease Score for the “readability” of your article. You mileage may vary but realistically, ScribeSEO gives you plenty of feedback on your article so that it is pretty easy to make the subtle changes to optimize for Search Engine readability. Candidly, many of my posts score over 90% consistently with the only shortcoming being keyword density or positioning of the hyper-links to referenced content. (This is probably due to my preference of using the noun instead of a pronoun which eliminates ambiguity and enhances readability.) Only my most technical of posts, the ones that are predominately “tech notes,” score lower. Another great feature is the suggestion of Tags for your articles as well as a full discussion of SEO Best Practices which provides a number of guidelines and tips so that you can start to learn to optimize your writing style. It also displays a proforma “Search Engine Results Page” showing what the result of someone searching for your content might see in the results listings of a search. Lastly, ScribeSEO provides heavy analysis of current keywords, suggestions on how to change keywords in the article to be more prominent, and alternative keyword suggestions for maximum impact. ScribeSEO Search Engine Optimization Plugin has a number of affordable pricing plans and various discounts are available.